In the right applications, metal-cored wire can often help companies eliminate hidden costs in the welding operation. When it comes to making decisions about the fabrication process, many companies have begun to look not just at the costs accumulated in the weld cell, but also at the total cost of the welding operation. Rightly so. Pre- and post-weld activities, product flow, inventory management and equipment selection can all have a significant impact on quality, productivity and profitability. The filler metal companies select is also important to consider, as it can create costs in many ways that may not be immediately apparent. These hidden costs can mean the difference between maintaining a gainful, competitive welding operation and trying to keep up with the rest of the industry. Since the 1970s, metal-cored wire has been a filler metal option for welding a wide range of applications, including mild and low alloy steels. The technology, however, has begun to gain greater popularity in recent years and has also undergone significant advancements, partly because it can be more readily alloyed to match different materials. Unfortunately, many fabricators may still not understand metal-cored wire or know its benefits. Here, we will examine the wire's basic technology, applications that can benefit from it and the ways in which metal-cored wire can help reduce hidden costs in the welding operation. Metal-cored wire consists of a hollow metal sheath filled with metallic powders, alloys and arc stabilizers, each of which offer distinct benefits such as lowering oxidation, providing higher impact strengths and reducing silicon deposits in the final weld. This mechanical and chemical structure causes the wire to operate differently than solid wires, which are solid throughout the entire cross section. It also generates different arc and weld profile characteristics. During the welding process, metal-cored wire carries the current through the outside metal sheath, resulting in a broad, cone-shaped arc (see figure 1) that creates a wide penetration profile and is capable of easily bridging gaps in the weld joint. The wire operates in the spray transfer mode, during which it creates very small droplets that deposit in the weld puddle but generate little to no spatter. Companies can use metal-cored wire for single or multi-pass welding in the flat, horizontal and vertical down positions. Using a standard CV (constant voltage) power source, they can also use the wires in the overhead position. Welding with metal-cored wire in the vertical-up position requires a power source with pulsing capabilities, and tends to be slower than welding with other types of wires. In most cases, metal-cored wire uses high argon shielding gas mixtures — a minimum of 75 percent argon is recommended (blended with a balance of CO2) and is typically available in diameters ranging from 0.9- to 2.4 mm. Metal-cored wire has a high burn-off rate that provides fast travel speeds and high deposition rates, especially in comparison to solid wires. It is also known to help minimize weld defects such as porosity, lack of fusion and undercut. Figure 1: Metal-cored wire produces a broad, cone-shaped arc that is capable of easily bridging gaps in the weld joint. Where does metal-cored wire work? Just like any welding technology, metal-cored wire is not a cure-all. It has distinct applications for which it is best suited, including those found in heavy equipment manufacturing, rail car fabrication, and food and petrochemical fabrication. The technology also works well on automotive exhaust fabrication, and wheel and chassis manufacturing. The wire's ability to excel in these applications is in large part due to the fact it can be alloyed for most every type of steel — from mild and stainless to low alloy. Metal-cored wire can often be used as an alternative to certain submerged arc or gas-shielded flux-cored wire applications. It can also be used in many of the same applications that employ solid wire, particularly those requiring single-pass welds that are 3 inches or longer, or applications welded in the flat and horizontal position using the spray transfer mode. Other applications where metal-cored wire works well include applications prone to burn-through; piping or other components where poor fit-up occurs and applications requiring aesthetic bead appearances. 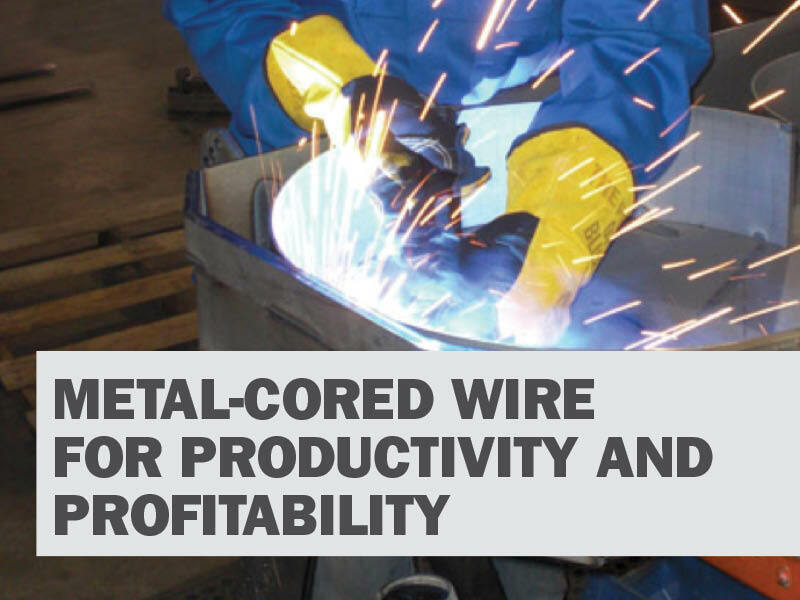 How can metal-cored wire reduce the hidden costs of welding? Metal-cored wire is capable of welding on a variety of material thickness (6mm and above, especially), which often makes it possible for companies to standardize on a single diameter wire throughout the welding operation. This standardization can help minimize inventory and the time associated with managing it, as well as reduce downtime for wire changeover. It also lowers hidden costs in other ways. Metal-cored wire can weld through mill scale and rust and still produce very little spatter, so it helps eliminate activities like grinding, sand blasting or applying anti-spatter prior to welding. It can also reduce the need to degrease materials prior to welding. Not surprisingly, such pre-weld activities often cause bottlenecks that adversely affect the throughput of the fabricated part, reducing the overall productivity and profitability of the operation. Further, they add to expenses for abrasives (grinding wheels or sanding disks), grinding equipment and anti-spatter solution. Such activities may generate costs for additional labour and could lead to costly health and safety problems. For example, activities like grinding may cause greater operator fatigue and/or repetitive stress injuries that could increase insurance costs. Pre-weld activities like anti-spatter application can also create downtime for cleanup, since the solution is notoriously messy and frequently needs to be cleaned off of equipment and the floors. Compared to solid wire, metal-cored wire carries the current through the outside metal sheath to create a wide penetration profile. The wire also operates in the spray transfer mode, during which it creates very small droplets that deposit in the weld puddle but generate little to no spatter. Since metal-cored wire can minimize defects such as undercutting or lack of fusion, companies may be able to reduce reject rates, along with the amount of rework in post-weld areas. Less post-weld activity can increase the flow of completed parts to other stages of production, too, such as painting or coating, to help improve overall productivity. In certain cases, the elimination of pre- or post-weld activities mentioned here can allow companies to reallocate labour elsewhere in the welding operation to produce more parts and increase the overall productivity of the welding operation. In the welding cell, the fast travel speeds and high deposition rates that metal-cored wire provides can frequently increase productivity, as well. Improvements are most often seen in robotic and automatic welding applications, but there is also the opportunity for measurable increases in semi-automatic applications. Metal-cored wire typically costs more than solid wire, but the benefits previously mentioned can most often help offset the per unit price. For companies considering this technology, it is important to conduct a thorough assessment of the existing welding operation to see if a conversion is justified. A good first step is to identify bottlenecks in productivity that exist due to pre- or post-weld activities and calculate the costs of for labour and equipment associated with them. Companies should look at the current quality of the parts being produced and the cost associated with any weld defects like undercut or lack of fusion. The cost of rejected parts should also be considered, as should the overall production rates. If the costs for any or all of the aforementioned activities are unnecessarily high or just higher than desired, further investigation into metal-cored wires may be warranted. Setting a good baseline for improvement through such assessments can help companies gauge the potential for productivity and cost improvements with metal-cored wire. It may also help justify the conversion to the decision makers in the company.